About fifteen years ago we received a polite invitation via email to attend a conference of alternative political points of view and so-called “conspiracy theory.” The sponsor was Muammar al Qaddafi, leader of the great state of Libya. Tempted to attend, we also had no idea how our presence there would be used or abused by the its host or our homeland. It took until winter 2001 for us to finally publish Qaddafi, in this case excerpts from his Green Book in our Extreme Islam: Anti-American Propaganda of Muslim Fundamentalism. TheGreen Book, a narcissistic and quasi-Islamic manual of right thinking for the Arab world at large, was obviously inspired by Mao’s hugely successful Red Book. Call Qaddafi what you will, but after he assumed leadership, he increased Libyan standard of living from earlier decades. Who knows how the forthcoming “democracy” will play out in the coming years. Here’s an excerpt from Qaddafi’s published story, Escape to Hell, which seems to be embarrassingly elementary, but perhaps he realized that a dictator’s text should as much like Mao’s or Emmanuel Goldstein’s as possible. 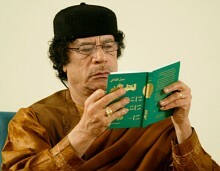 And as you can see, Qaddafi’s book posits a green understanding not unlike that promoted by the Sierra Club.